Sixty-eight years ago today, a fictional Little Rock heroine took the stage of a Broadway megahit when South Pacific opened at the Majestic Theatre on April 7, 1949. It settled in for a run of 1925 performances. Based on the James Michener Pulitzer Prize winning novel Tales of the South Pacific, it featured a book by Oscar Hammerstein II and Joshua Logan, songs by Richard Rodgers and Hammerstein and direction by Logan. It was produced by Rodgers, Hammerstein, Logan and Leland Hayward. Set in the titular islands, it concerned the relationships of sailors, nurses, island natives and other island inhabitants. In 2008, Lincoln Center Theatre produced the first revival of South Pacific on Broadway. It opened on April 3, just four days shy of the musical’s 59th anniversary. The cast was led by Paulo Szot, Kelli O’Hara (as Little Rock girl Nellie Forbush), Matthew Morrison (before “Glee”), Danny Burstein and Loretta Ables Sayre. The production restored a song which had been written for the original Broadway production that had been dropped. “My Girl Back Home” was featured in the movie version and in this Broadway revival. In it O’Hara and Morrison sang of their hometowns of Little Rock and Philadelphia. The production was nominated for 11 Tony Awards and won 7: Best Musical Revival, Actor in a Musical (Szot), Director of a Musical (Bartlett Sher), Scenic Design (Michael Yeargan), Costume Design (Catherine Zuber), Lighting Design (Donald Holder) and Sound Design (Scott Lehrer). Several Tony Awards have been won by a show with a main character from Little Rock. 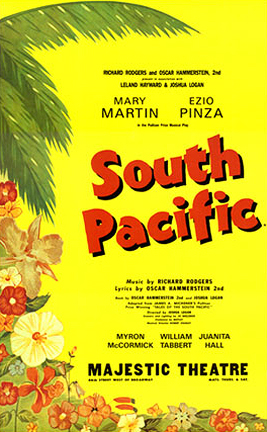 South Pacific opened at the Majestic Theatre on April 7, 1949 and settled in for a run of 1925 performances. Based on the James Michener Pulitzer Prize winning novel Tales of the South Pacific, it featured a book by Oscar Hammerstein II and Joshua Logan, songs by Richard Rodgers and Hammerstein and direction by Logan. It was produced by Rodgers, Hammerstein, Logan and Leland Hayward. Set in the titular islands, it concerned the relationships of sailors, nurses, island natives and other island inhabitants. Opening late in the season, South Pacific was named the 1949 New York Drama Critics Circle Best Musical, but was not part of the Tony Awards until 1950. (Though Jo Mielziner, who designed the set for South Pacific received a Tony for his set designs of shows during the 1948-49 season and South Pacific was one of the titles listed.) At the 1950 Tonys, it received six Tony Awards: Best Musical, Actor in a Musical (Pinza), Actress in a Musical (Martin), Featured Actor in a Musical (McCormick), Featured Actress in a Musical (Hall), and Director (Logan). This is the only time that all four acting awards in the musical category went to performers in the same production. In fact, the other two acting trophies that year were incorrectly engraved as being from South Pacific out of habit. Logan’s win was also the first time that the Director Tony went for a musical, since at the time that award was not separated out among plays and musicals. Hall was the first African American to win a Tony Award for Acting. Sher, Yeargan, Zuber, Holder and Lehrer are all reuniting again next season to work on a revival of Fiddler on the Roof. One of the producers of that is Little Rock native (and three time Tony winner) Will Trice. While Trice has not starred in a production of South Pacific, his mother Judy Trice starred in a statewide tour in the 1970s. A few years later, his sister Kathryn Pryor, starred in the Central High production. Sixty-six years ago today, a fictional Little Rock heroine took the stage of a Broadway megahit when South Pacific opened at the Majestic Theatre on April 7, 1949. It settled in for a run of 1925 performances. Based on the James Michener Pulitzer Prize winning novel Tales of the South Pacific, it featured a book by Oscar Hammerstein II and Joshua Logan, songs by Richard Rodgers and Hammerstein and direction by Logan. It was produced by Rodgers, Hammerstein, Logan and Leland Hayward. Set in the titular islands, it concerned the relationships of sailors, nurses, island natives and other island inhabitants.